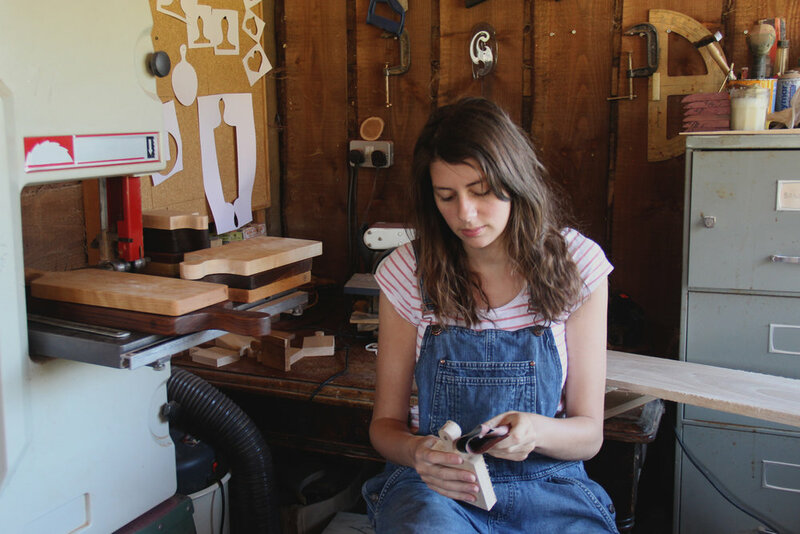 Rosie is a designer-maker, specialising in woodwork. She makes useful, beautiful and fully functional boards for serving and displaying food...creating each piece in her workshop in Devon. Rosie studied 3-D Design at Camberwell College of Art, graduating in 2012. During her time on the course she rediscovered her childhood love and passion for wood. Her parents had a sawmill and she spent her days climbing on log piles, drilling holes and making tiny bird boxes. After she graduated she set up her studio with inherited and donated tools and launched her business. Rosie uses the living history of the tree to inform her designs. Twisted grain from reaching towards the sun, imperfections from diseases, spalted marks from fungus, knots and splits where branches once grew and finally marks from where it fell or was cut down - all guide the sizes and shapes of her work.